We are thrilled to welcome inspirational mezzo-soprano Clare McCaldin to the 2018 festival. 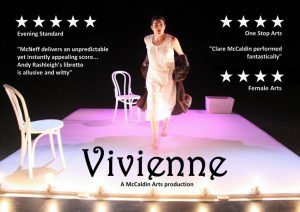 Clare comes to Beverley to give a one-off matinee performance of Vivienne in the East Riding Theatre on Sunday 8th April. This captivating piece of music theatre was premiered by Clare in 2013 at London’s Tête à Tête opera festival, receiving a ★★★★★ review from the Evening Standard. Vivienne tells the story of Vivienne Haigh-Woods’ disastrous marriage to TS Eliot in a staged cycle of six songs by Steve McNeff. McNeff’s score alludes to music hall which was a favourite of both Eliots. The mesmerising work, lasting only 45 minutes, is at turns disturbing, poignant and witty. Clare’s ‘richly sung, richly imaginative’ recording of the short piece on her 2016 disc ‘Notes from the Asylum’ with New Paths’s artistic director, Libby Burgess, on the Champs Hill label was given ★★★★ by BBC Music Magazine. Don’t miss this remarkable one-woman show, sure to be a highlight of New Paths’ residency at the East Riding Theatre this spring. Read more Clare McCaldin here.